This is a recipe that I don’t make often, and when I do I choose a day when I know I have plenty of time. I also make a gargantuan batch so I have plenty for the freezer. 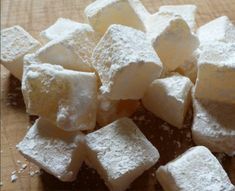 This is one of my youngest son’s favorites, and I’ve been known to get up early to steam some of these yummy little bits so he can take them to school in his thermos for lunch. There are two menus I prepare for my family so I have the necessary leftovers for making shumai. First, I get a 4 pound pork tenderloin roast and roast it in the oven, as well as an assortment of veggies. One of our favorites is squash and apples. The next meal I fix is an Asian chicken salad using a portion of a large head of napa cabbage. I’ll try to blog that recipe at a later date. Measurements given below are approximate for an average batch, but I never follow them and I always make way more. Any type of mushroom will work. 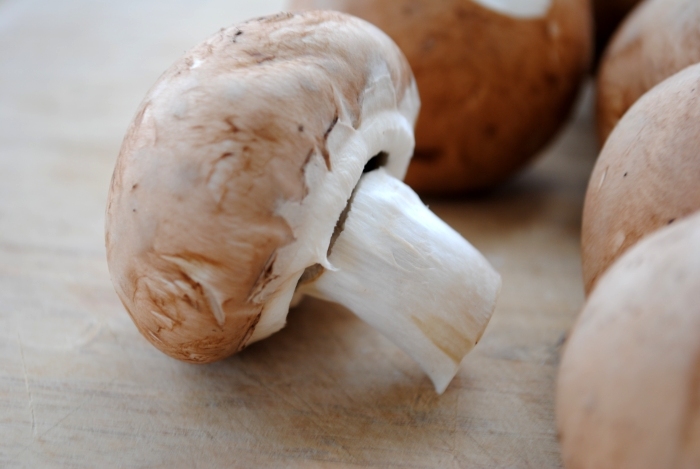 I prefer shiitake, but they can be expensive and are not always available in the markets in my area. This time I found some very reasonably priced, beautiful organic baby bella mushrooms. I make the dipping sauce the day before so it will have plenty of time for the flavors to blend. Simply mix the ingredients together and store in a jar in the refrigerator. 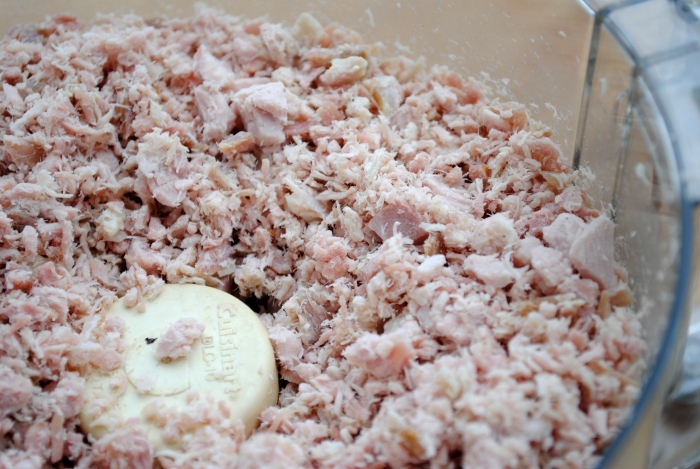 Here’s a picture of the consistency I like the pork to be ground. I want it fine enough that the finished filling will hold together, but still coarse enough that the pork can be identified in the mixture. I chop the veggies at this consistency. 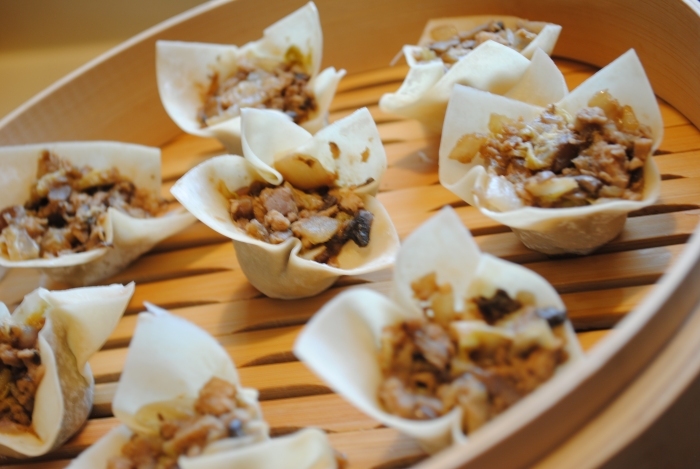 Once all of the grinding, chopping, dicing, and shredding is completed it’s time to prepare the filling for the shumai. Heat sesame oil over medium heat. Add mushrooms, onion, and ginger. Cook until onions and mushrooms are softened. 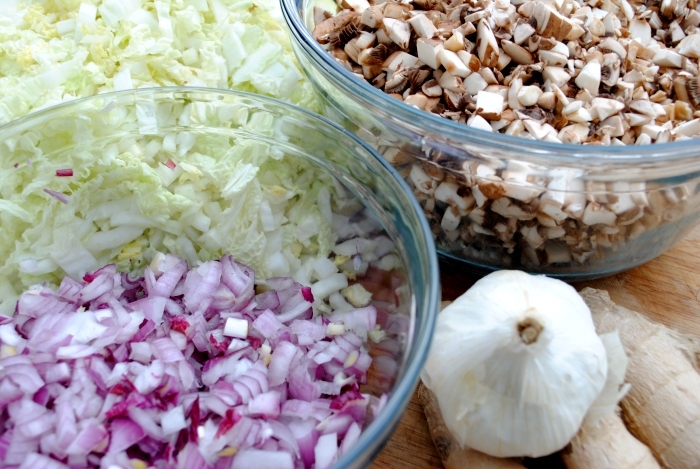 Add cabbage and continue cooking until cabbage has softened and reduced significantly. Add ground pork and hoisin sauce and mix thoroughly. I don’t measure my hoisin sauce. I add it a dollop at a time until the ingredients are coated and the mixture tastes appropriately seasoned. Take the mixture off the heat and allow it to cool until it can be handled comfortably. 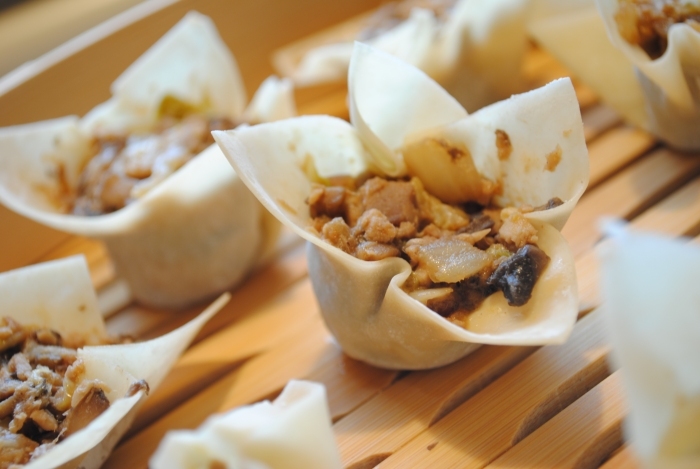 This is one of the ways I assemble my shumai. I find it the fastest way to put them together if I’m going to steam them immediately. 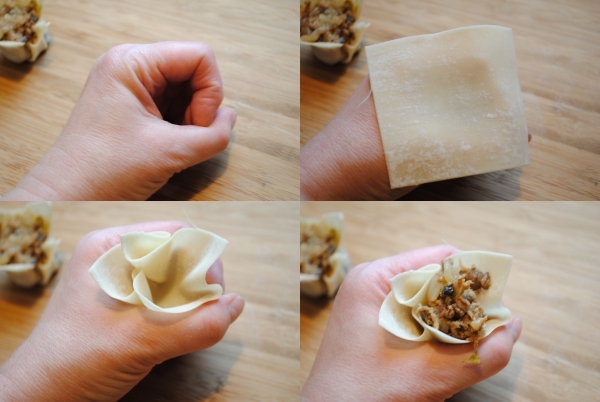 If I’m going to freeze them, then I fold them up using a samosa (with a twist) wonton fold. The link shows a number of different wonton folds, and one of these days I’m going to get around to trying more of them. I’ve also used this filling to make egg rolls. For egg rolls I tend to use a larger proportion of cabbage in the mixture. Once the shumai are assembled, I place them in my Bamboo Steamer and steam for about 6 minutes. I use a double decker steamer basket so I steam them for 3 minutes, reverse the top and bottom baskets, and steam for an additional 3 minutes. Serve with dipping sauce. My family enjoys steamed rice and some homemade eggdrop soup with our shumai. Today has been one of those cold rainy winter days, perfect for spending time in the kitchen. About an hour ago the rain switched over to snow, and it feels good to be snug and warm inside with the scent of cinnamon, vanilla, and mace lingering in the air. 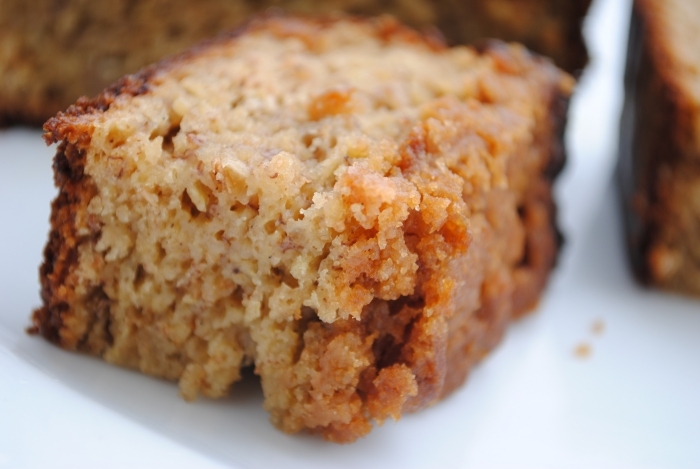 I made a family favorite, my spiced banana bread. As we were demolishing the warm treat, it was decided that it’s more like a coffee cake than bread, and that I should start baking it in a cake pan instead of a loaf pan. We also speculated that it might be even better if I topped it with some of the oatmeal crumble that I normally use as a fruit crisp topping. 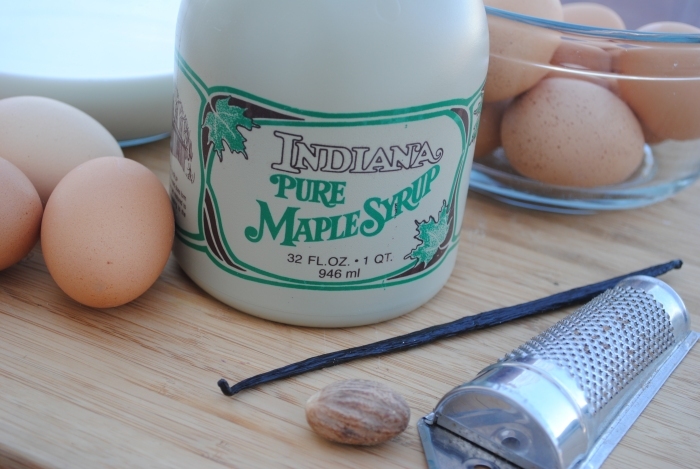 I thought today would be a good day to give another maple syrup recipe. Bart informed me he’s getting close to finished with the sugaring season, and enough syrup has been bottled that we can start selling it. Ordering has been enabled on his website, so come and get it! As usual, I tried to use as many fresh, local, organic, or homemade ingredients as possible. I had a couple of overly ripe organic bananas, my fresh homemade sour cream, maple syrup Bart made, eggs from the neighbors, organic vanilla beans, organic flour, wheat germ and bran. A little side note on the eggs: I’ve decided to start keeping my own laying hens again this summer. I’ve decided to keep Delawares, a heritage breed on the critical endangered list. I’ve also located a source for organic non-GMO feed. More to come on that subject in a couple of months or so. Preheat oven to 350°F. Lightly grease and flour a 9×13 cake pan or a couple of 7×3 loaf pans. Mash banana into total submission in the bottom of a mixing bowl. Add sour cream, butter, maple syrup, eggs, and vanilla specks. Beat until thoroughly blended. In a separate bowl blend together remaining dry ingredients. Stir the dry ingredients into the wet ingredients until just moistened. Bake for 50 to 60 minutes, or until a toothpick inserted in the center comes out clean. 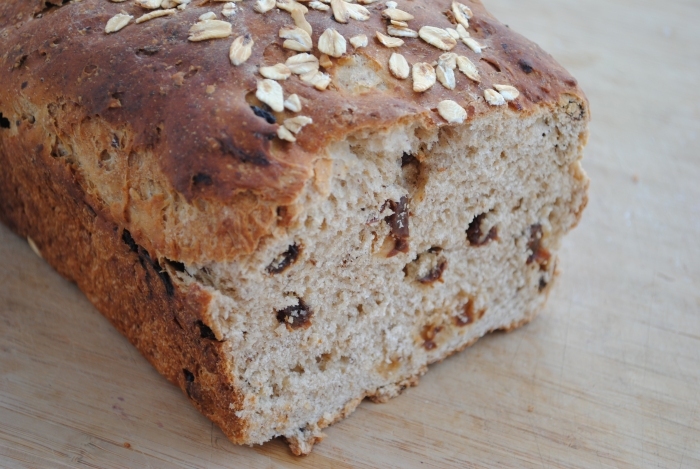 Last week I made a couple of loaves of organic whole grain raisin bread. For some reason only one loaf got eaten, and I found myself with a whole loaf of stale raisin bread. Also, with maple syrup production in full swing, I had a little of last year’s syrup that I wanted to use up. 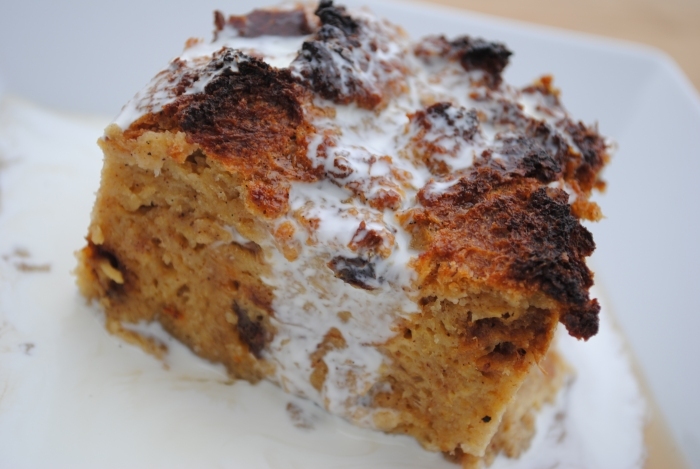 Maple Bread Pudding was the solution to my overabundance of stale bread and old maple syrup. This recipe uses stale bread. I’m telling you, the texture of the finished pudding won’t be right if you use fresh bread. If you don’t make your own bread, then something like stale french bread from your local bakery can be used. However, don’t use that soft chemical laden stuff that masquerades as bread. 1 1/2 cups amber or grade B maple syrup. Save your good light stuff for pancakes. Place bread cubes in a buttered 9 x 11 baking dish. Whisk together milk, eggs, maple syrup, salt and spices. Pour egg mixture over bread cubes. Place dish in refrigerator for about an hour. It’s important to give the bread cubes plenty of time to absorb the liquid if you want your pudding to have a nice silky texture. I made mine up the afternoon before and refrigerated it overnight so that it was ready to bake on Sunday afternoon when I had the oven already heated for a roast chicken. Place a roasting pan with about an inch of water in the oven, and preheat to 350. Place pan of bread pudding in the water and bake for about an hour. I’ve discovered that it’s quite common for ovens to be out of calibration, and highly recommend the use of an oven thermometer when preheating. I really need to get my oven calibrated. I have to turn my oven on to 420 to heat to an actual 350. 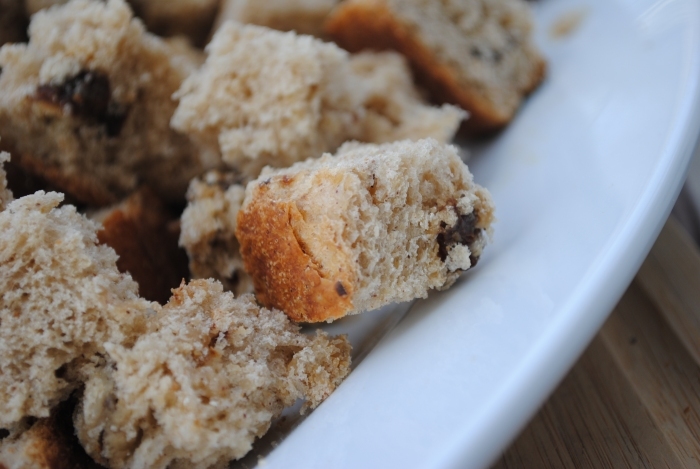 Remove bread pudding from oven and allow to cool for a little while. Serve with a drizzle of maple syrup and a couple of generous splashes of cream. This stuff is comfort food at it’s best! Near mid February here in Northeastern Indiana, our day time temperatures creep into the 40’s melting off the long winter’s blanket of snow, and our night time temperatures dive back below freezing. Each year when my husband notices the signs indicating this change is about to take place, he takes to our woods and begins setting up his maple sugar camp. A couple of weeks ago he began cleaning buckets, assembling equipment, and organizing his camp in the woods. 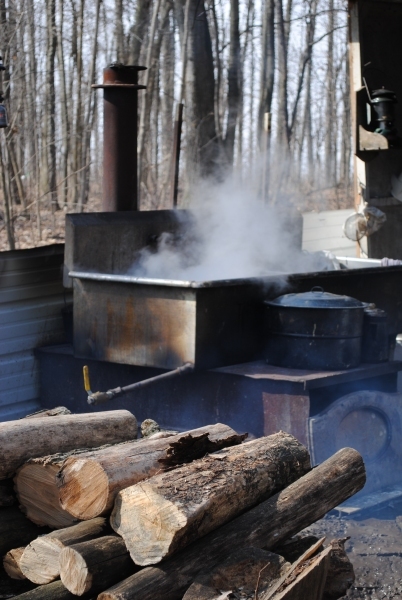 Last weekend weather conditions indicated that the first major sap run of the season was imminent, and he placed more than 150 taps in the maple trees. A couple of days later the day time temperatures soared into the 40’s and 50’s and the sap began to run. 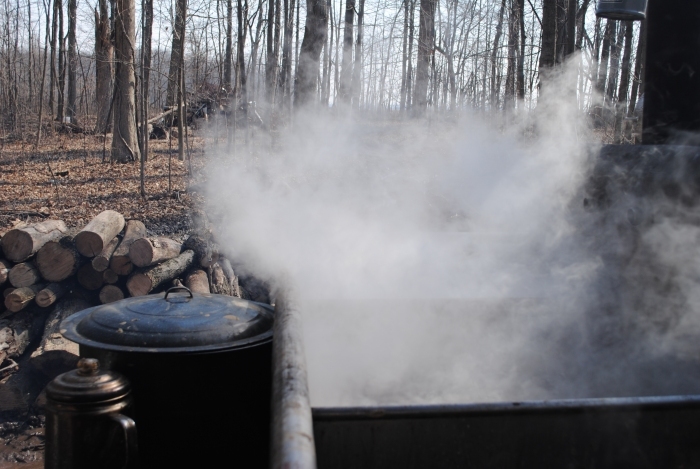 By Thursday it was time to start cooking the sap down into maple syrup. Once cooking starts, Bart lives in the woods. I’m not kidding you. 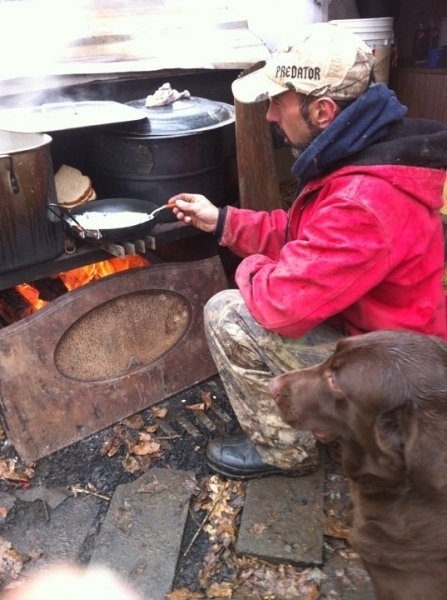 He sets up a cot and sleeps in the woods on nights when he needs to keep the fire burning under his cooker. He also cooks quite a few of his meals over the fire. In the shot below, sausage gravy and toast is on the menu. Being a two business family, the 3 to 4 week sugaring season can be a little rough for us. Bart is careful not to schedule construction jobs during this time, and I try to hold things down at home and in the shop. I try to make trips back to the woods on the weekends, but by the end of the whole thing I’m usually feeling a little testy. However, the reward of a year’s supply of sweet, natural maple syrup is well worth the hassle. Bart sells some of his surplus syrup to help offset the cost of bottles, filters, and some miscellaneous supplies. Due to numerous requests from non-local friends who wanted to purchase syrup, we set up a website last year at Bart’s Maple Syrup. Syrup should be available for sale within the next couple of weeks or so. The syrup will be available on a first come, first served basis. When it’s gone, there won’t be any more until the next sugaring season.